Play Lucky for Life for luck that lasts a lifetime! Just think of all of the things that you could buy. 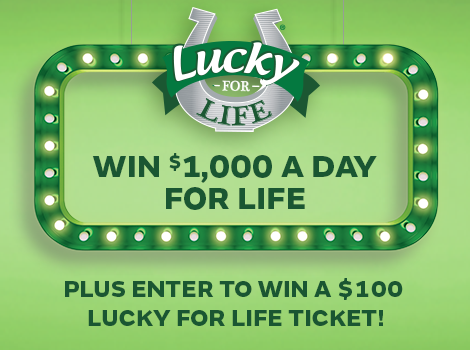 To enter to win one of (5) $100 Lucky for Life tickets with 2 sets of Quick Pick numbers for 25 draws on (1) ticket, simply answer the question on the right. You'll get another chance to enter next week, too! What facts are true about Lucky for Life? Pick 5 numbers from 48 and 1 from 18 for the Lucky Ball, or ask for a Quick Pick. Top prize is $1,000 a day for life. Second top prize is $25,000 a year for life. Are you a MyLottery Member? Log in or sign up now (optional). I am at least 18 years of age and I agree to the contest terms and conditions. I want to receive email updates.